A lot of articles and blog posts about thyroid dysfunction tend to focus on the signs and symptoms of hypothyroidism, or an underactive thyroid. However, it’s estimated that between 3 and 10 million people actually suffer from an overactive thyroid, or hyperthyroidism.1 The most common form of hyperthyroidism is the autoimmune condition known as Graves’ disease. I myself was diagnosed with Graves’ during my second year of medical school. 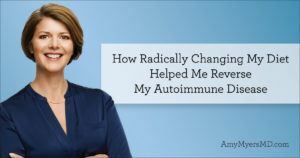 In my book, The Autoimmune Solution, I share my personal experience with Graves’ disease and how conventional medicine failed me in that process. I never want anyone to go through what I had to go through to treat my Graves’ disease, so it is my mission to educate as many people as I can that there is a healthier and more natural way to recover from Graves’ and other forms of hyperthyroidism. Your thyroid, the butterfly-shaped gland in the front of your neck, produces hormones to help regulate body temperature, heart rate, growth, energy production, and brain health. Hyperthyroidism is a condition that occurs when the thyroid is overactive and produces too much thyroid hormone. When thyroid hormones are too high, energy metabolism will speed up, causing the body to burn through nutrients too quickly. This can result in malnutrition and lead to a wide range of problems. I personally was eating everything in sight and went from a size 4 to a size 0 in a matter of months. Trust me when I tell you that it was not healthy! There can be many reasons for the thyroid to be overactive, yet this most commonly occurs as a result of the autoimmune condition, Graves’ disease. Graves’ disease accounts for roughly 60-80% of all hyperthyroid cases.2 Normally, thyroid function is regulated by the pituitary gland, a tiny gland responsible for secreting TSH, which signals the thyroid to produce thyroid hormones T3 and T4. In Graves’ disease, an antibody known as thyrotropin receptor antibody (TRAb) can mimic pituitary hormones and completely override the system, causing an overactive thyroid. 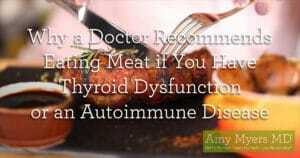 You can also develop Thyroid Peroxidase (TPO) antibodies or Antithyroglobulin antibodies. I personally did not have antibodies to TRAb, I only had antibodies to TPO. I see this very frequently in my clinic as well. Two other forms of hyperthyroidism are non-autoimmune conditions known as toxic multinodular goiter and toxic adenoma. Toxic multinodular goiter involves the growth of independently functioning nodules on the thyroid gland itself. These nodules are able to stimulate the thyroid without the use of TSH, thereby overriding the system and causing an overactive thyroid. Similarly, toxic adenoma is a benign tumor consisting of thyroid follicular cells, which produce excessive amounts of T3 and/or T4. The excess thyroid hormones produced by toxic adenomas can suppress the function of remaining healthy thyroid tissue, leading to hyperthyroidism. 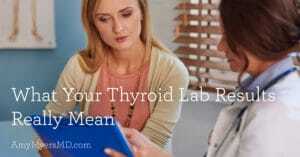 Blood testing your thyroid hormone levels is the first step. In hyperthyroidism, the thyroid-stimulating hormone (TSH) will be very low and the Free T4 and Free T3 will be elevated. In autoimmune conditions, you will see elevated levels of antibodies as well. To read more about optimal thyroid lab values, you can read my article on the thyroid here. Radioactive iodine uptake (RAIU) is the next step in diagnosing a thyroid imbalance. An RAIU using a small dose of I-131 will determine how much iodine the thyroid takes up. A high iodine uptake is indicative of Graves’ disease. This test can be helpful in ruling out other possible causes of overactive thyroid. Ultrasound (US) of the thyroid is helpful to look at nodules on the thyroid, and your doctor may request you have a fine needle biopsy to confirm that the nodules are not cancerous. Gluten is a huge problem for most people these days because we hybridized it, modified it, and it’s in everything! Worst of all, it can wreak havoc on your gut and set you up for a leaky gut. Once the gut is leaky, gluten can get into your bloodstream and confuse your immune system. Since the building blocks of gluten share a similar molecular structure with building blocks of your thyroid gland, the immune system can get confused and accidentally attack your thyroid gland. This process is called molecular mimicry. You can read all about how gluten contributes to thyroid disease in this article. In order to absorb nutrients, the gut is somewhat permeable to very small molecules. Many things including, gluten, infections, medications and stress can damage the gut, allowing toxins, microbes and undigested food particles – among other things – to enter directly into your bloodstream. Leaky gut is the gateway for these infections, toxins, and foods like gluten to begin causing the systemic inflammation that leads to autoimmunity. You must first repair your gut before you can heal yourself. Iodine status is a bit controversial. It seems that too little iodine can cause goiter and hypothyroidism and too much can cause hyperthyroidism. When the body detects an increased availability of iodine, this can trigger the thyroid to produce more thyroid hormone. 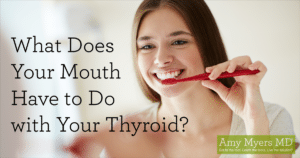 If someone with a relatively low intake of iodine suddenly consumes a very iodine-rich diet, then over time that individual can produce an excessive amount of thyroid hormone, resulting in an overactive thyroid. Conventional medicine is only focused on treating symptoms, not on getting to the root cause of the disease. Medications, radiation, and surgery only treat the overactive thyroid gland in hopes of reducing symptoms of the disease. In order to truly solve the problem and repair your thyroid and immune system, you must take a functional medicine approach and find the underlying cause of the imbalance. I personally tried two out of three of these treatments, and it’s honestly my only regret in life. Please do not make the same mistake I did. Propylthiouracil (PTU) is an antithyroid drug that interferes with the production of thyroid hormones. Simply Google these medications and you will see a long list of dangerous side effects, one being the destruction of your liver. I took PTU when I had Graves’, and that’s exactly what happened to me. I was confined to bed rest until my liver healed, which nearly cost me my life and medical school. Methamazole is another antithyroid drug administered for hyperthyroidism. As a result, this drug can actually cause hypothyroidism, requiring the careful monitoring of TSH and Free T4 levels. Side effects include rash, hair loss, vertigo, jaundice, aplastic anemia, lupus-like syndrome, and hepatitis. This approach uses a large dose of radioactive iodine (I-131) to permanently destroy thyroid gland cells. After this procedure, you are destined to a life of manufactured thyroid hormone medication. After getting toxic hepatitis from the PTU, I had no choice other than to do this treatment myself. 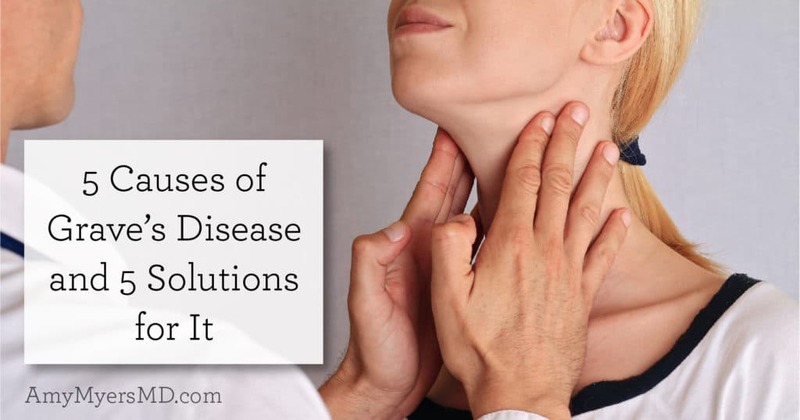 I truly believe that if I had discovered functional medicine sooner, I would have been able to reverse my condition and save my thyroid from destruction as I have done with numerous patients in my clinic. When antithyroid medications and radioactive treatments are not viable options, doctors may recommend a partial thyroidectomy, which is when part of the thyroid gland is surgically removed. This is actually the option I recommend as a last resort if someone is not able to reverse their hyperthyroidism using a functional medicine approach. The key to reversing your Graves’ disease is getting to the root of what triggered your hyperthyroidism in the first place and addressing those underlying causes head-on, rather than just treating the symptoms or resorting to harsh measures as I was forced to. 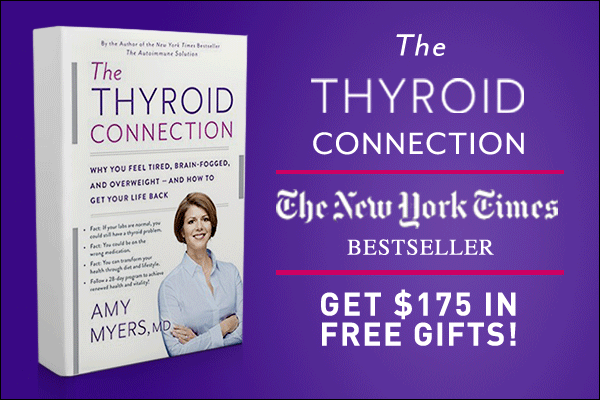 I cover exactly how to do to this step-by-step in my book, The Thyroid Connection, using The Myers Way® 28-day plan. The basics of this plan are outlined below. I recommend that all of my patients remove gluten from their diets because it’s simply an inflammatory food. For my patients with autoimmune diseases, such as Graves’ or Hashimoto’s thyroiditis, I highly recommend they remove all grains and legumes from their diet as well. These foods contain proteins known as lectins, which act as a natural pesticide for crops and can wreak havoc on the lining of your gut. Changing your diet is the first step in getting well. I created The Myers Way® Comprehensive Elimination Diet eCourse, which you can do at home and is the foundation that I use with my patients to begin recovering from illnesses. Repairing your gut is essential to healing yourself, as I mentioned before. 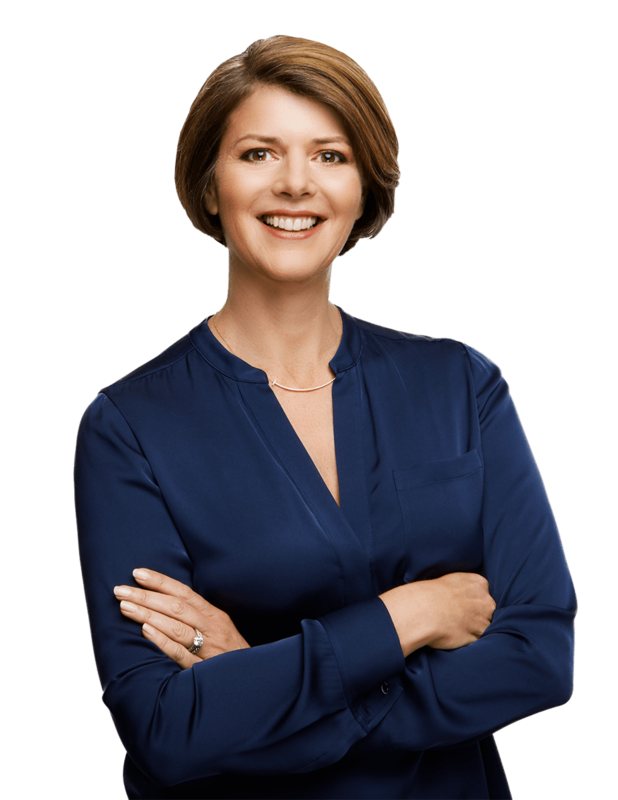 For this reason, I created The Myers Way® Guide to the Gut eCourse to help guide you through the exact same steps I use with my patients to repair a leaky gut. I also have many articles explaining my 4R approach to repairing the gut and gut-repairing supplements. We are exposed to heavy metals in a number of different ways: amalgams, fish consumption, and the environment. I recommend having your MTHFR genes tested and doing a DMPS chelation challenge test through a functional medicine practitioner to determine if mercury or other heavy metals are an issue for you. Have your doctor test for infections such as HSV and EBV. Monolaurin from coconut oil can be very effective treatment for both HSV and EBV. Lysine and a lysine-rich diet is effective at treating HSV infections. Supplements like vitamin D, omega-3 fish oils, and glutathione are powerful immune modulators, which means that they can help support your immune system. Vitamin D has been shown to help regulate the immune system. Omega 3 fish oils help to reduce inflammation in your entire body. Glutathione is your body’s most powerful antioxidant, which can help reduce inflammation and improve detoxification. While you work to address the underlying cause of your thyroid disorder, you can ease your symptoms and support your thyroid with supplements and thyroid-calming herbs. Here are the ones I have found to be most helpful. Bugleweed – This plant is rich in Lithospermic acid, an organic acid that decreases levels of thyroid stimulating hormones, T4 (the storage form of thyroid hormone) and T3 (the active form). It also prevents thyroid antibodies from binding to your thyroid, which is a huge help to patients with Graves’ Disease. Motherwort – A member of the mint family, this herb alleviates symptoms related to hyperactive thyroid such as heart palpitations, anxiety, sleeplessness, and decreased appetite. Please note that it might cause miscarriage, increase uterine bleeding, and potentially interact badly with many cardiac medications, so be sure to check with your doctor before taking it. Lemon Balm – This herb is also a member of the mint family and seems to block hormone receptors, preventing TSH from binding to your thyroid tissue and keeping antibodies from attaching to your thyroid. As a result, it helps to calm thyroid symptoms by reducing stress and anxiety, improving sleep and appetite, and easing pain. A high-quality multivitamin is one of the four supplements that I recommend EVERYONE should be taking. Because hyperthyroidism causes your body to go into overdrive, you are at an even greater risk for developing certain nutritional deficiencies than most people. I specifically formulated The Myers Way® Multivitamin for my patients with thyroid dysfunction, including Graves’ disease and Hashimoto’s. My multivitamin provides the optimal level of thyroid-specific nutrients such as selenium, zinc, and iodine to support thyroid health. Plus, the B vitamins and minerals included in The Myers Way® Multivitamin are in their activated forms to optimize detoxification and methylation, ideal for those with an MTHFR mutation.